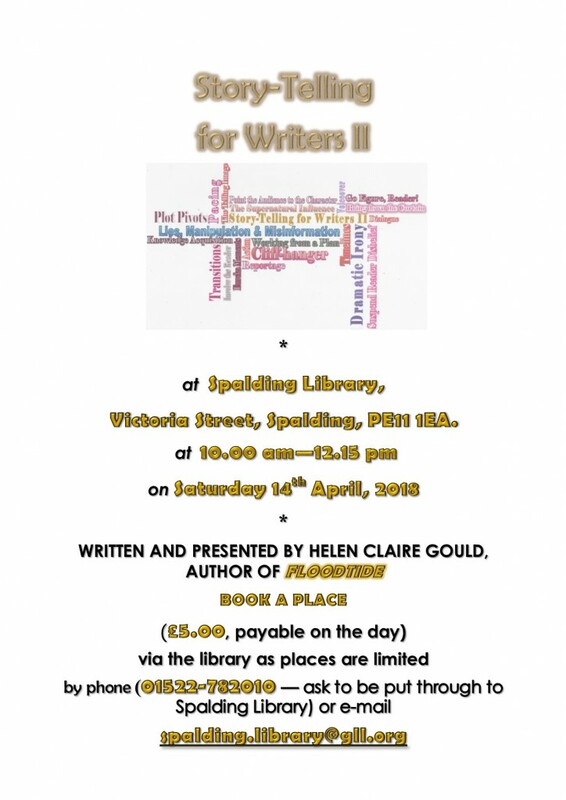 The next writers’ workshop to be held at Spalding Library will be Story-Telling for Writers II, on Saturday 14th April, starting at the usual time of 10.00 am. Here’s the poster for it. 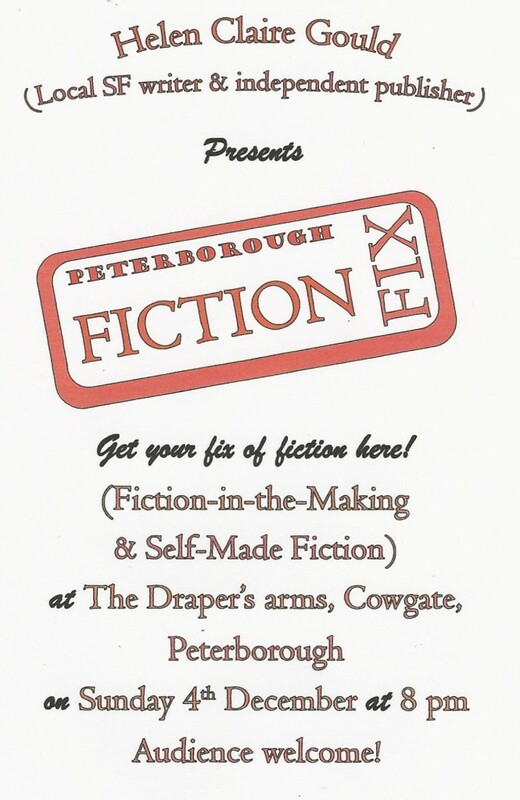 You’ve probably seen that, due to the weather and my illness, we’ve had to move Fiction Fix to Sunday the 18th March. We’re still celebrating International Women’s Day with readings about female protagonists. So please do come and join us at our usual venue, The Draper’s Arms, and join in and enjoy the evening. Here’s the updated poster with all the details on. ‘IT WAS ON THE OUTSKIRTS OF THE SOUK that I first glimpsed it: pure white, a stallion, flared nostrils exhaling steam. Elemental, a figure out of the foundry of hell itself. ‘It trotted past the great trunks of the Caliban trees, weaving a pattern between them that paralleled their movements. Its eyes glinted red and wild in the sunlight, meeting mine with a knowing gleam and innate insolence. My pulse flared and the blood trembled in my veins, yet I couldn’t look away. Despite my fear the horse’s beauty caught at my heart. ‘The grey disappeared around the edge of the forest where the Calibans grew more thickly, and for several moments I stood staring after it. 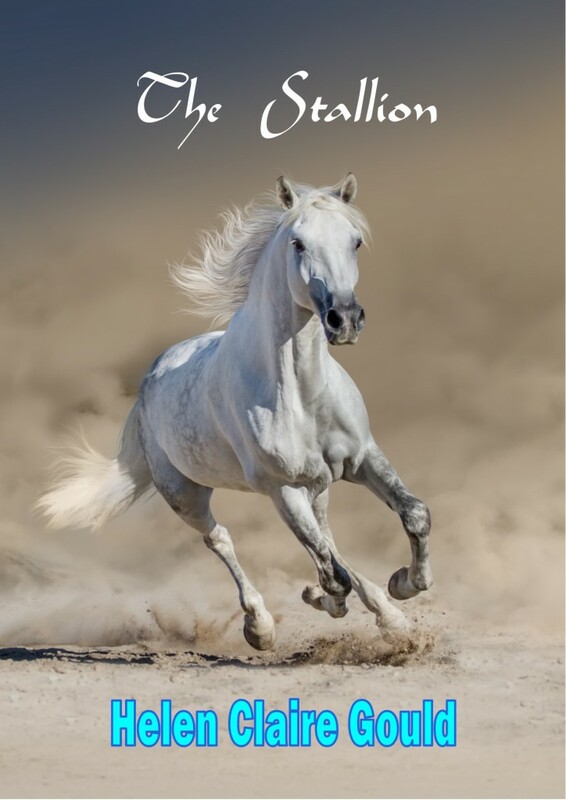 The Stallion, my new book. My new book The Stallion probably isn’t even long enough to qualify as a novella – more of a long short story – but it’s being launched next Wednesday (21st March) at local bar, Puzzles? which is on Bridge St, Peterborough, nearly opposite Waterstones. The event starts at 8 pm – 10 pm, and includes readings and activities with the accent on fun, so if you’re reading this, do come along and join in, and in case you live too far away, we hope to live-stream the launch to Facebook. If we have the opportunity to film it, it will go up on YouTube and Vimeo. This is the story I got up in the middle of the night to write, after an extraordinarily vivid dream. About an hour and a half later, Mike woke up and realised I wasn’t in our room, and eventually found me typing away like mad in the Study. I’d written about half of an initial draft, and immortalised the source dream in the process. It’s an ecological fantasy (I could have invented a genre there), an Arabian-Nights-styled SF/fantasy with the main character a young colonist of a frontier planet in the universe I write in. Not forgetting his beautiful white horse. We hope to live-stream the event to Facebook, and perhaps post it on YouTube, so if you can’t make it there in person, you should be able to see what’s going on, either on Facebook or on YouTube. If you’re reading this, I hope to catch up with you there. What a great night at the Draper’s Arms last night! Many thanks to all the people who turned up and either read or listened. I managed to speak to most people and know that they enjoyed themselves, but for anyone I didn’t get to speak to in the break or afterwards, I look forward to catching up with you next time. Readers were Jilly Paddock, Mark Fryday, Morgan Fitzsimon and myself. We usually start with work that is already self-published or independently published, but last night, as there were quite a few pieces which fell into the not-yet-published section, we reversed the order and started with the Fiction-in-the-Making section. Jilly read from her next novel, Warbird, Mark gave us a sneak peek into his forthcoming novel The Innocence Machines, after which I interviewed him about the differences between his current and next work, and I read from my next novel, The Zarduth Imperative – Discovery. After the break Jilly continued the section with her latest fantasy story, Ladder to the Moon. We continued the readings with the Self-Made Fiction section, with Morgan reading from The Last Enchanter and a reading from Floodtide by yours truly. But the evening didn’t really end there, because there was quite a bit of discussion going on for a while after that. I enjoyed the night very much and the others seemed to as well. 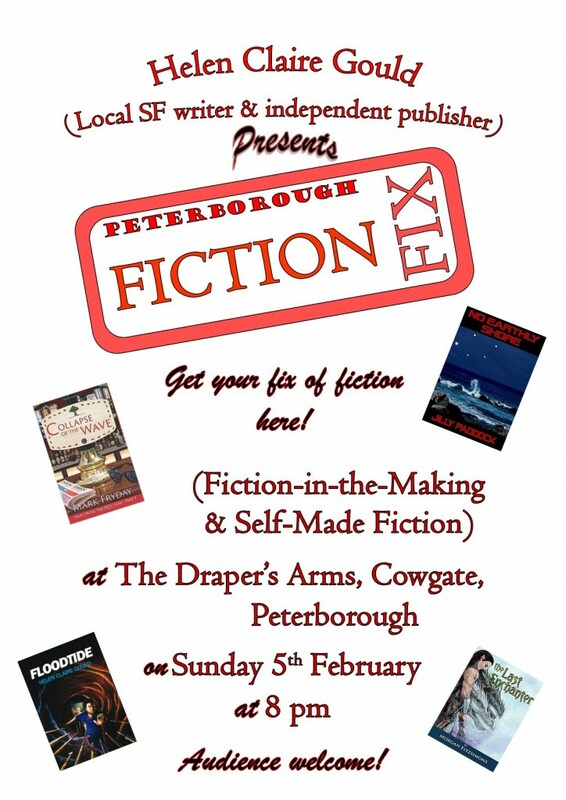 The next Fiction Fix will be at the Draper’s Arms, Cowgate, Peterborough, (post code) on Sunday 5th February. We look forwards to seeing you there! It looks as if the first month of the New Year is going to be just as busy as most of 2016 was. 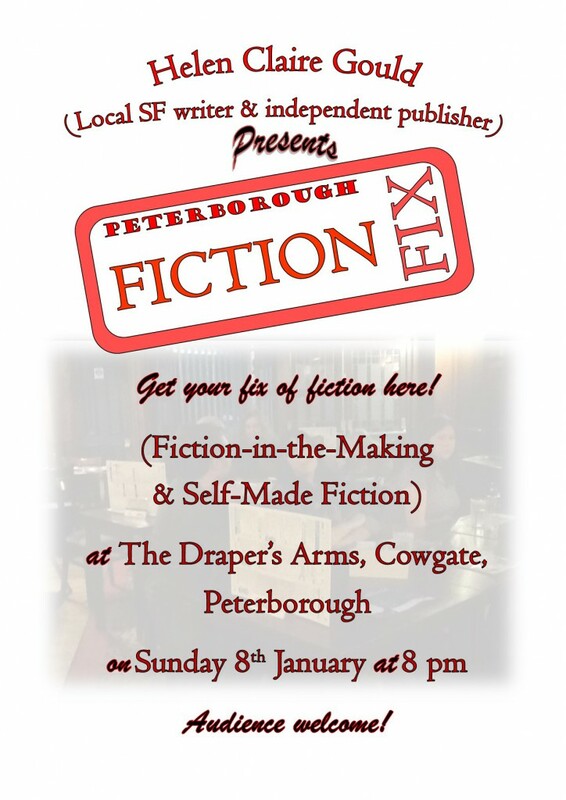 For a start, there’s another Fiction Fix on Sunday 8th January. 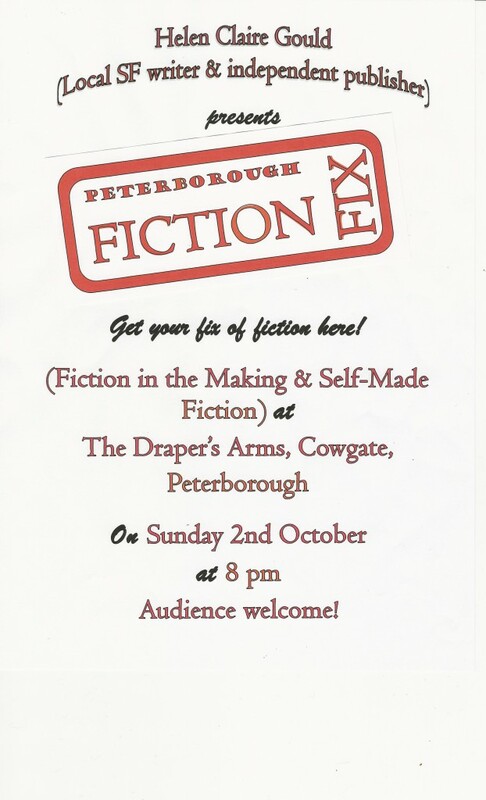 If you’re a writer and want to read your work aloud, or if you just fancy coming along to listen, keep in touch via The Finger on the Pulse, my private Facebook group for this regular monthly event at The Draper’s Arms on Cowgate in Peterborough. PM me on Facebook to join it. the meetings are usually on the first Sunday in the month, but as this happens to be New Year’s Day that seemed a bit impractical as the pubis unlikely to be open. 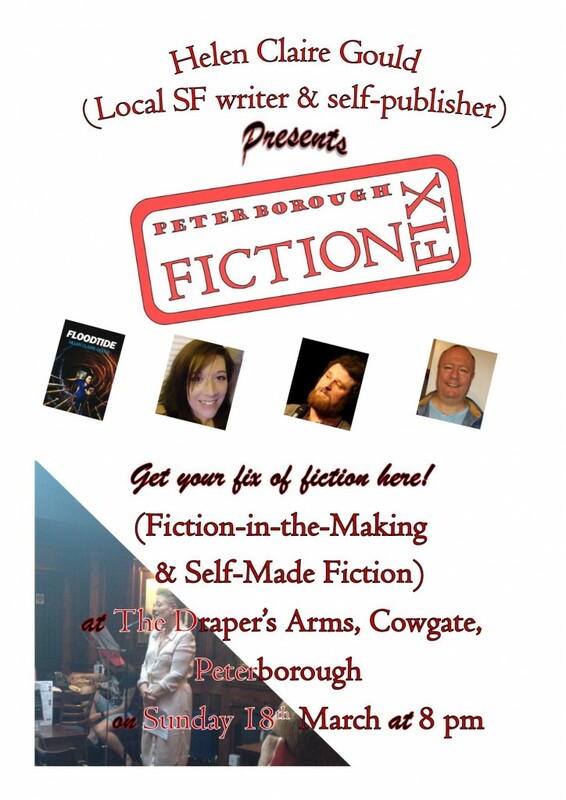 Peterborough Fiction Fix meeting poster for January 2017. 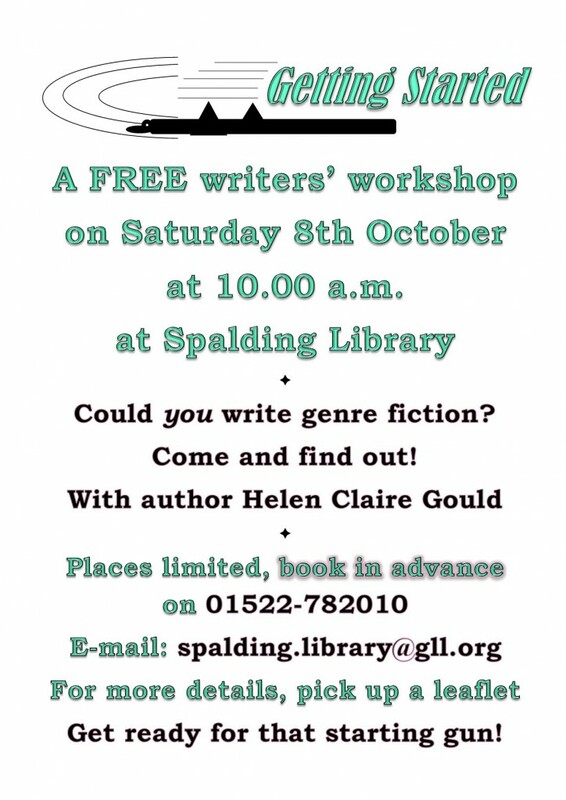 Secondly, the following weekend I’ll be running the next of the series of writers’ workshops at Spalding Library. This is Story-Telling for Writers II. Last time we looked at the structural devices that can be used in telling your story. This time we’ll be looking at the story-telling devices you can use to control the flow of information to the reader and ensure you don’t repeat yourself. 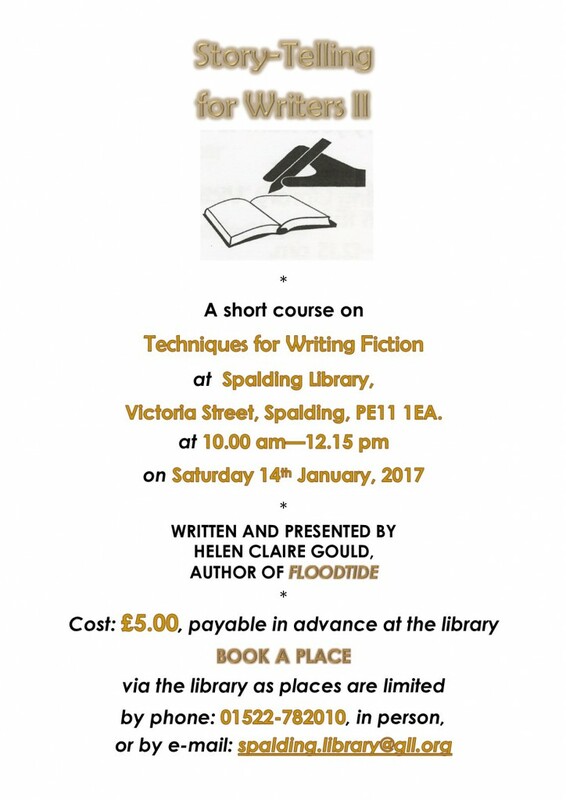 Contact the library to book, there may still be a few places left. 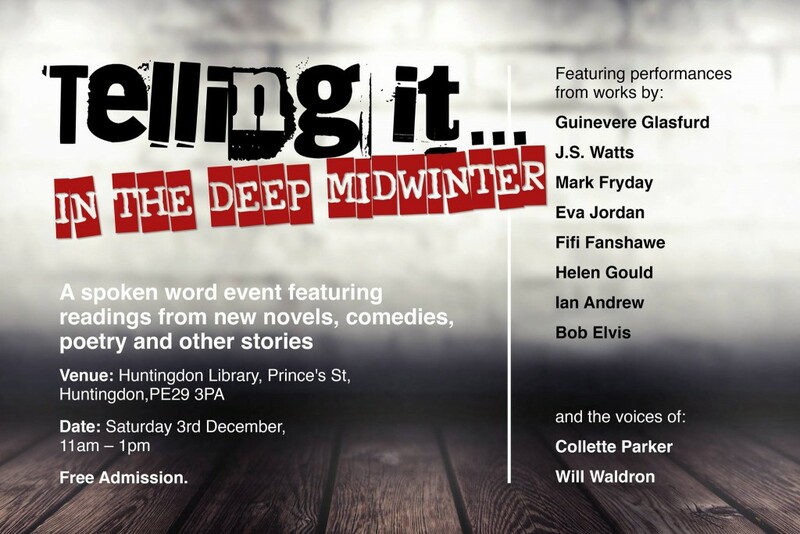 I also have an appearance tomorrow morning at Huntingdon Library with the Telling It group. This is part of Huntingdon Library’s Author Festival, and is the first time I’ve read with them, but I’m looking forwards to it. I will be reading a new childrens’ story I’ve written. I don’t normally do childrens’ fiction, but I thought I’d have a go as the library wanted something Christmassy/wintry and the Naxadans don’t celebrate Christmas! This is the poster for the latest Telling It public meeting. 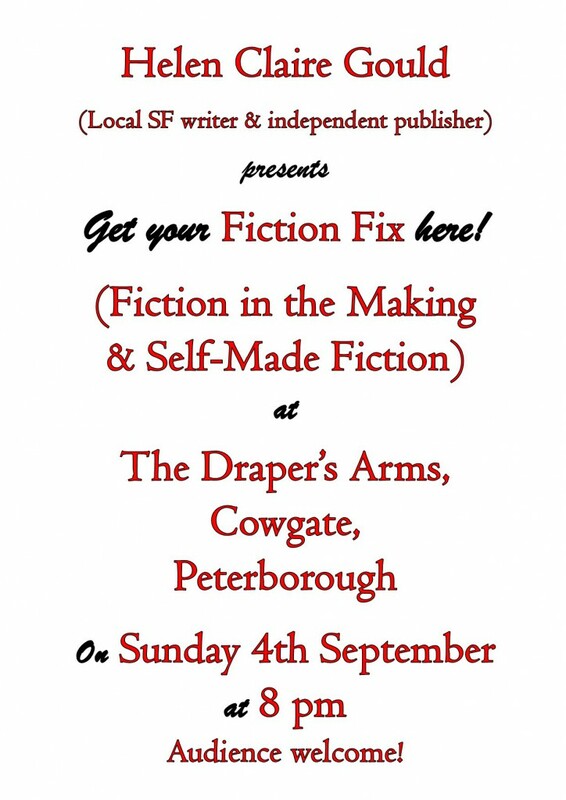 And on Sunday there’s another meeting of the Peterborough Fiction Fix. The poster is below. There will probably be some open-mic slots available during the evening. Poster for the first part of Story-Telling for Writers. 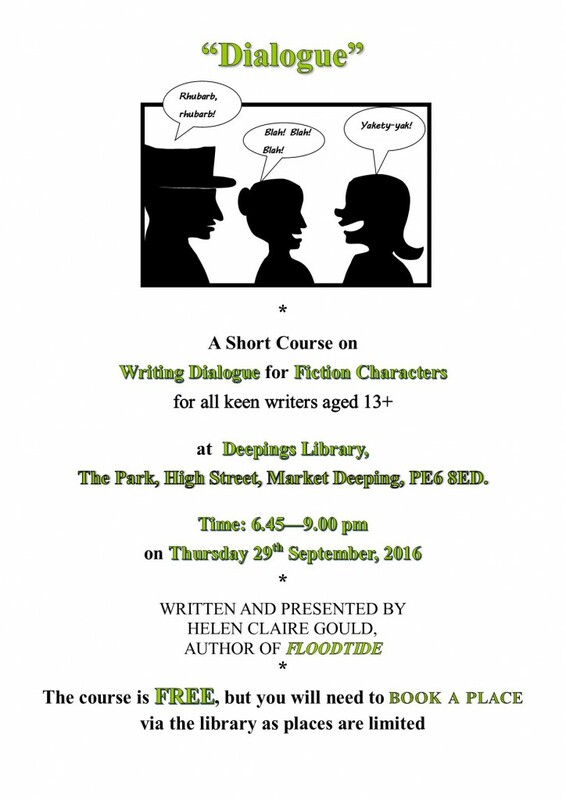 Poster for Getting Started workshop at Deepings Library. This workshop has up to 15 places available and will be FREE again as it’s my free taster workshop, Getting Started. You will still need to book a place, so contact the library for this, details of opening times if you’re phoning them above in the poster, and the e-mail address for use at any time is also shown. Please don’t expect an immediate reply if you’re e-mailing, as the library’s opening hours are a bit limited – but at least they are still there, and the library itself is thriving! 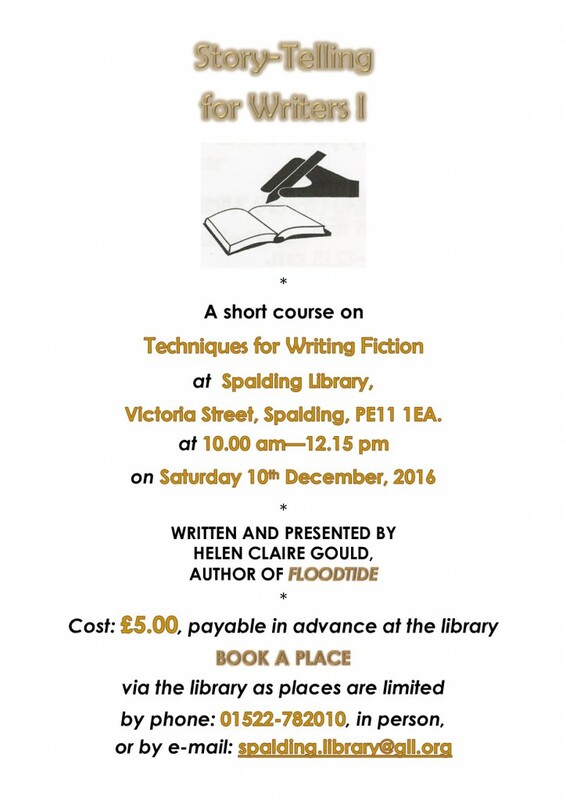 The next workshop for writers at Spalding Library is on Saturday 5th November, at the usual time of 10 am, and it’s already almost full! There are 12 places and it’s £5 to attend, payable in advance at the library. I hope to see you there! will be at 8pm at The Draper’s Arms, on Sunday November 6th. Further details to follow. We hope to see you there! 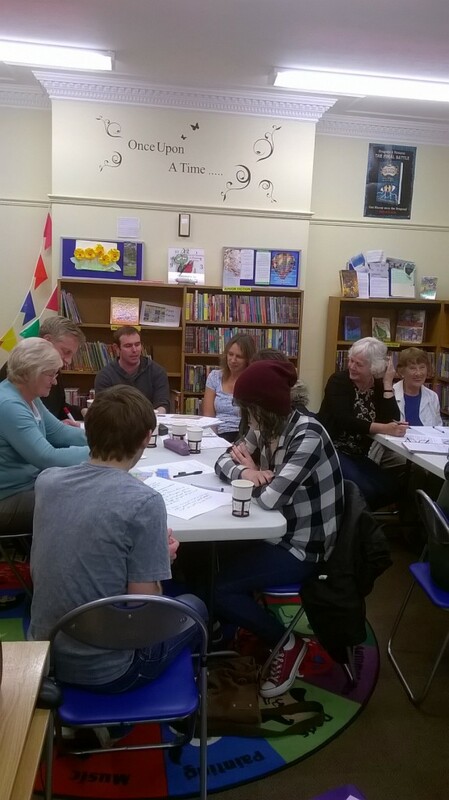 This workshop ran on Saturday 8th October, and was probably the most successful workshop I’ve ever run. I’ve since heard from several people that it was a lot of fun, as well as teaching them ways of getting their work started off. This event is next Saturday but all the places are now filled. 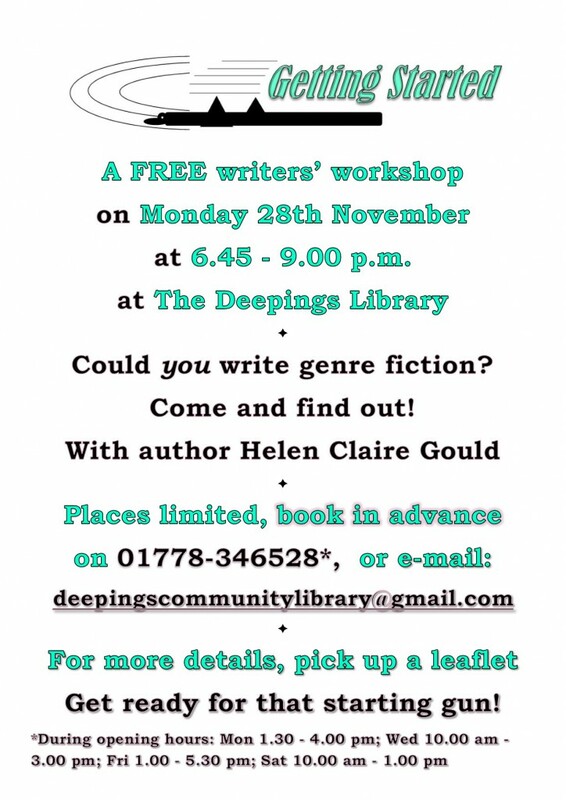 However, I am running it again at The Deepings Library soon – we know it’ll be in November, and that it will also be a free event, but we just haven’t yet worked out when it will be. Watch this space! 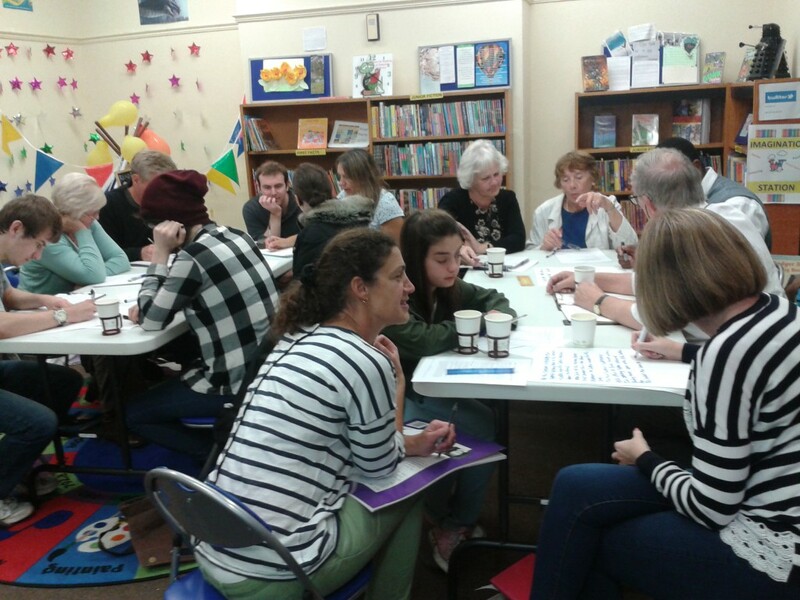 Never Mind “Four Weddings and a Funeral”, there are Two New Workshops and an Author Event! 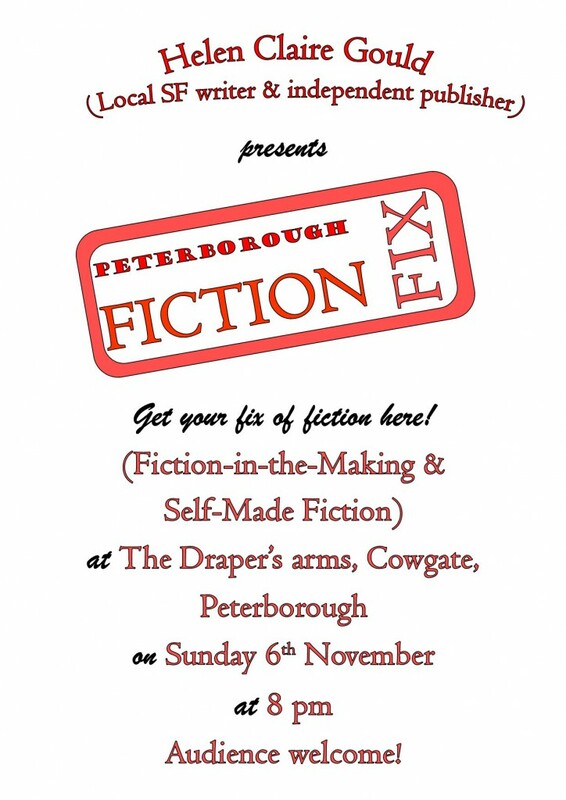 That’s not to mention another Peterborough Fiction Fix. 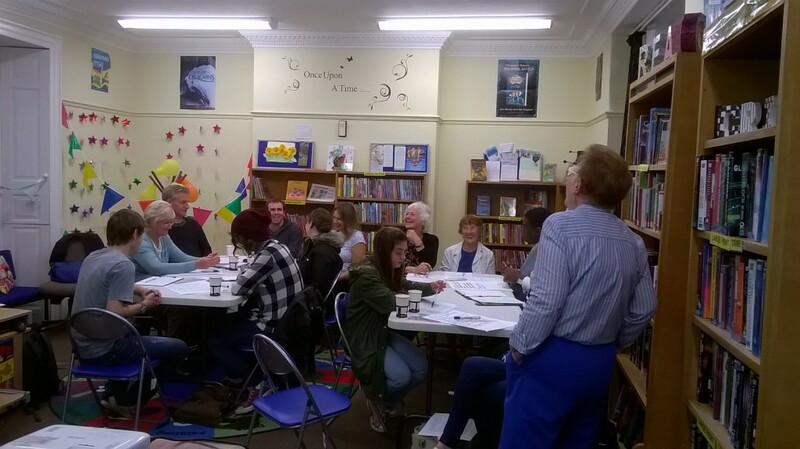 The first workshop is at The Deepings Library, and celebrates the takeover of the library by GLL – and, of course, its continuance as a proper library. The Friends of Deepings Library fought legal battle after legal battle to stay open and serving the public in the Deepings, and as soon as I heard that Lincs. County Council wanted to close them, I contacted them and offered to run a free workshop – I thought it might help bring local people onboard for the fight. My reason for doing so was that I feel quite a connection to the library, not just because I’m now an author, but because between 2000 and 2005 I taught Geology and Creative Writing at The Deepings School, and I used to drop in to the library with leaflets and posters, and they always displayed them for me. I went to a couple of their events to raise local awareness and enthusiasm, and encountered at one of them a gentleman who used to be in my Geology class – which was great! However, FODL decided that they’d prefer it if I ran that workshop for them after the takeover…so that time is – well, if not now, then very soon! And because I’m doing that for them, they’re putting on an author event for me, which is why there are 2 posters below! I will be reading from my current novel Floodtide and from my next novel, The Zarduth Imperative, and will have my usual display of rocks and minerals that the hero of Floodtide, Jordas, would see in the lava tubes of Naxada. 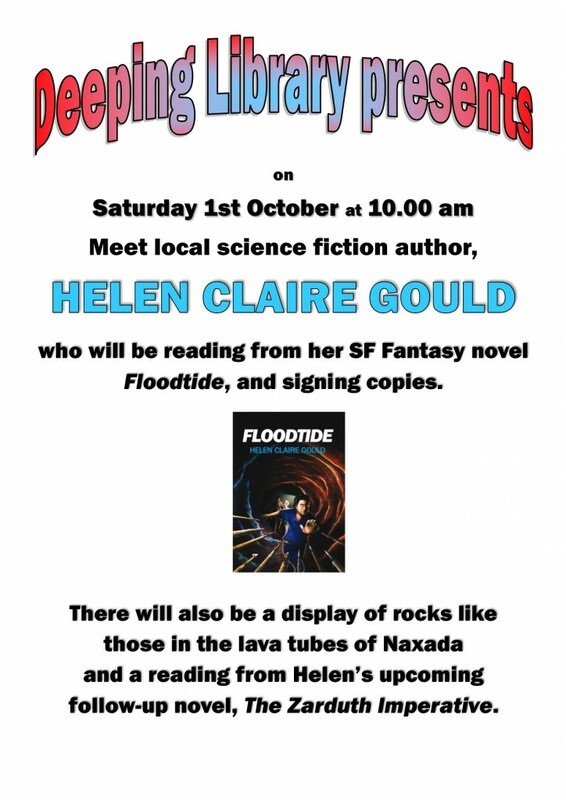 Copies of Floodtide will be available to buy and have signed as well. So get your diary out, make an entry, book a place on the workshops, and we’ll see you there! Starting next month there will be a series of meetings in pubs, bars or cafes, where fiction will be read aloud to an audience, by the writers. This is Fiction in the Making (i.e. 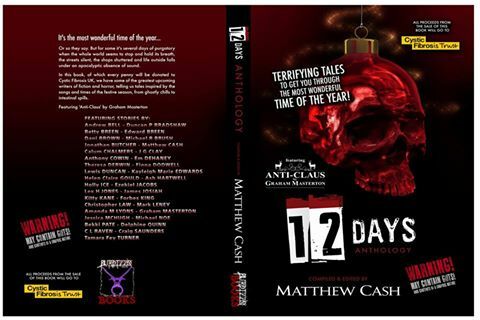 it’s not finished yet, but the writers want to dip their toes in the water and see how it goes down) and Self-Made Fiction (it’s been self-published). So come along to the first meeting at The Draper’s Arms on Cowgate, Peterborough (just round the corner from the bus station) details below – and bring your ears! The pub has food available, the usual (beer and so on), and for anyone who doesn’t drink alcohol, coffee and tea and soft drinks are available through the evening. Regrettably, I have had to cancel the two workshops below, due to unforeseen circumstances. I hope to be able to run them in the near future. On Wednesday, 6th July, at 6.30 pm – 8.30 pm, I will be delivering a Self-Publishing workshop at City College, Brook St., Peterborough, OE1 1TU. The title is: Print vs. e-Publishing: Which Should you Choose? This is a preliminary look at the differences between getting your novel printed and having it formatted for e-publication. 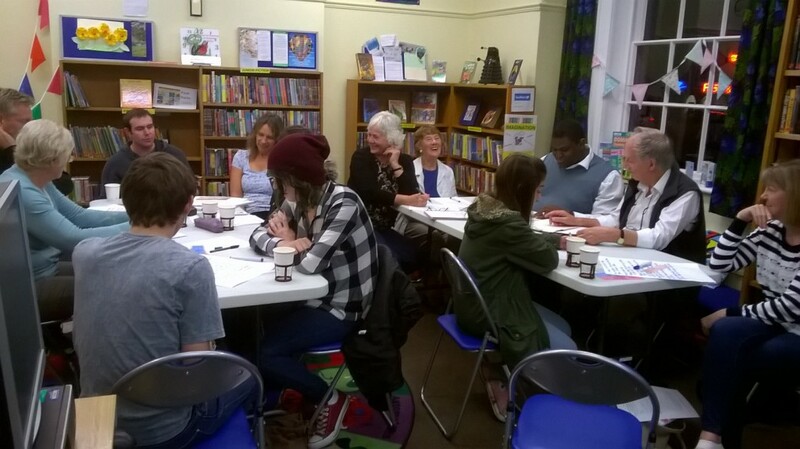 And on Thursday 14th July (the following week) I’ll be delivering a Creative Writing workshop at The Goldhay Centre, 105, Paynels, Orton Goldhay, Peterborough, Cambridgeshire, PE2 5QP. This workshop is entitled “Dialogue”, and covers as many aspects as possible of writing dialogue. 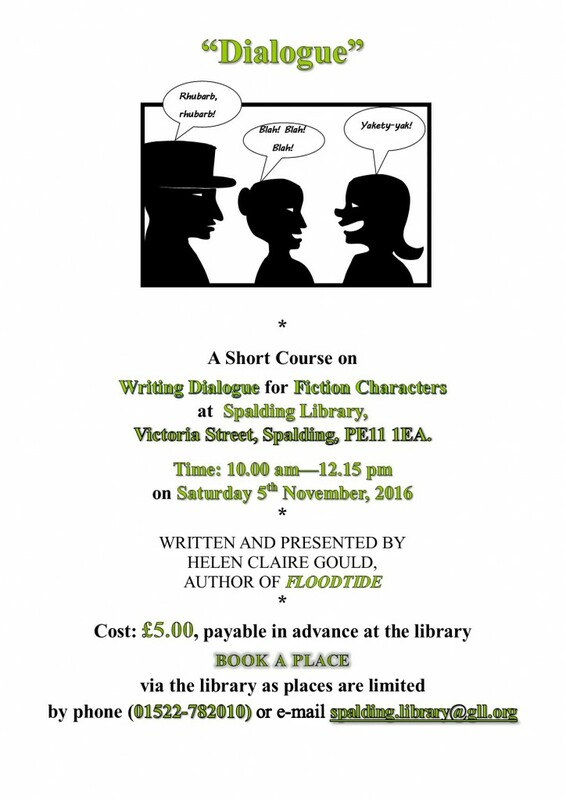 There will be lots of writing exercises, and some de-mystifying of myths related to writing dialogue! This workshop runs from 6.45 pm – 9 pm and it’s also priced at £15/person. New Geology Talk at Ayscoughfee Hall Museum, Churchgate, Spalding, Lincolnshire, PE11 2RA. Geology Workshop at Ayscoughfee Hall Museum, Churchgate, Spalding, Lincolnshire, PE11 2RA. I’m pleased to report that this event had an appreciative, if small, audience. One gentleman told me he’d never look at rocks in the same light, having spent 20 minutes or so looking at a selection of representative rock types through a hand lens. I have to agree – I do think that even the slightest of nodding acquaintances with geology can change the way you view rocks. You start off by thinking they’re all either grey, black or brown, and end up realising that in fact, due to the minerals that make them up, they are composed of many different colours and textures. It was as much of a revelation to me when I started researching rocks to get the background to Floodtide right. 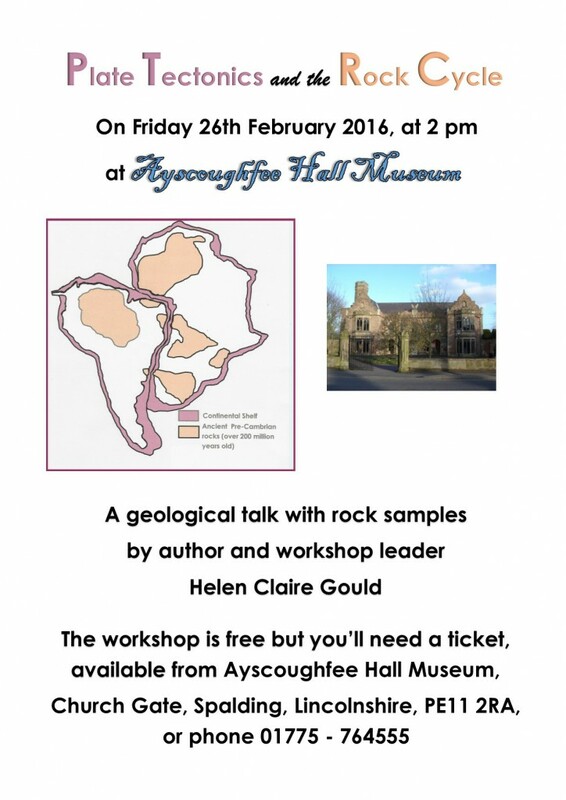 On Friday, 26th February, at 2 pm, I will be running a geology workshop at Ayscoughfee Hall Museum. This fine building, recently renovated, will provide a magnificent setting for the workshop, which is on Plate Tectonics and the Rock Cycle. The workshop will start with a PowerPoint presentation on how the rock cycle interacts with plate tectonics, a summary of the evidence for both of these Earth systems, and an overview of the theories for the formation of our Moon, one of which may well have kick-started plate tectonics on Earth. This will be followed by a closer examination, using rock samples and hand lenses, of some major types of rock which form part of the rock cycle. The workshop is free, but you’ll need a ticket, which can be obtained from the Museum from next Thursday on. There are 40 places available. Pop into the museum for a ticket or book by phone on 01775 764555.